I’m no engineer but I’m very civil, and I must say that looks deucedly solutiony! Walter – thanks for the comment -appreciated. Wish the piers were on rock. Given the surrounding terrain, my guess is that there is about 10 feet of pit-run fill at the front (pictured) pier row and way less at other 2 rows. 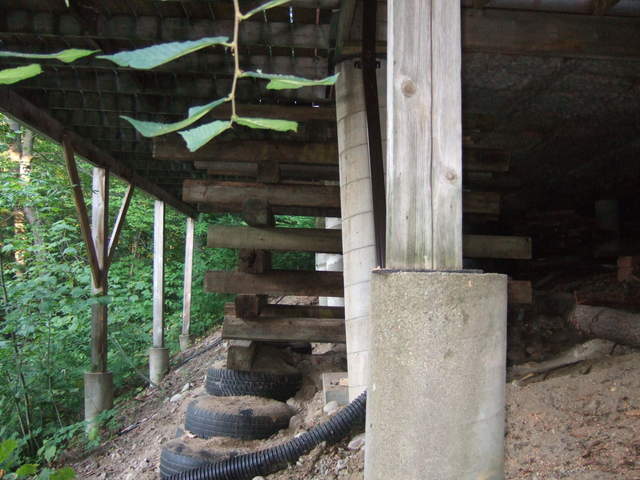 I asked original owners if they placed the pier footings below the original groundline. Thirty years ago, they went down about 4 feet and placed the piers on precast pads (maybe 16 inches square – there’s one in the picture). My take is the pads are on uncompacted fill that have sunk at the front piers, way more (up to 4 inches) than at the other 2 rows of pier. 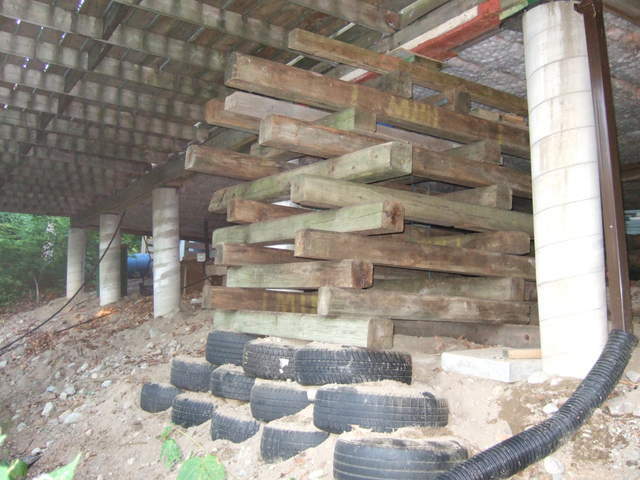 Think that as they “sunk” they pulled the other rows of piers over (distance increased and support beams can’t stretch so something had to happen), until they were all leaning in some kind of load equilibrium. When I re-leveled the cottage I likely re-started or sped up the process. The cottage has a truss roof so all the snow load goes to the front and back set of piers. My solution is to expose the pier pads front and back, and jack the pier/pad bottom forward so the piers are vertical, and hopefully jimmy another pad under 1/4 to 1/2 under the existing pad as I push it forward. Benefit – cottage is closer to the lake. I’m hoping that doing the front row only will be sufficient – also wondering if leaning the piers in the opposite direction will counteract the horizontal forces. I also plan to place a reinforced concrete “collar” just below the groundline of each pier to add to the lateral stability and as well as some bearing to the front piers. Finally hoping the tires will allow higher fill around the piers and therefore also help to support the cottage for the next 30 years, when I may need to worry about it again. I’ll be around 90 so, will need something to keep me going. Think you will have to visit to do a proper inspection. Increasing the bearing surface of the pier footing with the new pads should go far to reduce or eliminate the settlement movements. I’m assuming the pit-run is a clean free-draining material so that frost heave of the ‘collars’ is not an issue. With regards to adding more fill around the piers – I can see the lateral support benefit of this but would be concerned that this may set off a more global consolidation of any underlying unconsolidated fill. I had a slope failure investigation a few years back that involved a house in a residential subdivision that backed on a deep ravine. No issues for over 40 years and then “suddenly” tension cracks in the backyard, movement of the rear wall of house, and major angst for the elderly couple who had been there since the house was built. The slope investigation revealed that the slope had always had a factor of safety of just over 1.0 (which is the norm for most naturally occurring slopes). The equilibrium buster – landscaping – the couple had the backyard landscaped and the addition of approximately 0.4 to 0.6 m of soil to level the backyard and create some plant beds had been enough to set off slope movements. So I’d be wary of adding any surcharge to the fill as that may set off or accelerate consolidation. No problem. I have no idea what you’re talking about, but what the heck!! I’d hate to have his cottage get a much, much closer view of the lake, if you know what I mean. Hello Tony, this is Nic Perrella from Perth in Western Australia â€œdown underâ€. I love the pictures – I have seen a few beauties in my time and I have reckon you have one on your hands, but I can just imagine the view over the lake. I can see you are a true Perrella that likes a construction challenge (must be in our blood), let me know if you need a hand – my tip from â€œdown underâ€ – there is nothing that a good piece of solid concrete in the right spot wonâ€™t fix. â€œ30 years to fix itâ€ – you are definitely a Pereella. If you shout me a trip to Canada I reckon we would have it sorted out in no time. I think Luisa is right we do worry over a problem until we have it sorted, I am the same and often will over do the solution. Nic – nice to hear from you, and condolences (kidding) on the Perrella afflictions. I definitely will be pouring concrete to fix it. I also like the spotting a trip/helper idea, but then I started thinking of those ocean fish pictures you sent. Hard choice – concrete mixing or fishing? How about – you spot me, I spot you! You have the Perrella frugalness (cheap) affliction too?